It's been interesting to watch homegrown new-thrashers Evile grow in the post-new-wave-of-revivalist-thrash years. They've certainly been one of the better-known bands (perhaps even the British flagship thrash revivalist group as past reviews here have dubbed them) yet have come under pretty heavy fire for the clear influential debt they owe to Metallica. Skull is no exception, yet it's not automatically a bad thing – let's be honest, 'Tallica rule(d), and a band that continues where they left off with ...and Justice for All would equally rule. I've always held off pure praise for Evile though, mainly because as close as they come to thrash heaven with past releases they haven't released the spectacular masterpiece that the thrash world could do with. As Five Serpents's Teeth showed, they're solid and enjoyable, but nothing new or surprising, and Skull is pretty much more of the same. Opener Underworld is one of the best tracks, kicking off with speed metal vim and having a good enough groovy thrash breakdown that it stays with you, together with some typically delicious soloing. The hooks scattered liberally throughout the album are hard to fault, even if the songs sometimes seem a bit too similar in structure, but it's undeniably effective and I imagine goes off a bomb live. What you can't criticise is the performances, from Ben Carter's drums to the riffing team of Ol and Matt Drake, the band's roots stretching back to 1999 and the experience showing. Throughout the lead guitar work shows that the band do have originality – not quite enough of it for my tastes, sadly, but it's always appreciated when it appears. Sadly time has clearly taken its toll; Ol Drake recently announced he's had enough of the touring lifestyle and is leaving the band, making Skull his swansong. He's got plenty to be proud of – the galloping riffage of The Naked Sun is intense, leading to one of the album's best choruses, and there's not a dull track on the album, even the initially acoustic-strewn Tomb thanks to it developing into a strong atmospheric mid-paced piece. 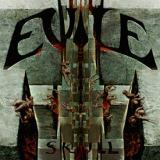 Ultimately, your view of Skull will depend on your view of Evile. It's hard not to listen to the likes of Head of the Demon, so close to Metallica, and think that the band are unlikely to break out and produce something genuinely original. As good as the song is, the debt owed is so strong that it's impossible to forget. And as strong as the eternal impulse to listen to some classic metal always is, it's even harder to ignore when listening to Skull with the knowledge that you've not listened to classic Metallica in ages. Yet I think letting problems like these drag this album down is unfair to it, especially given how good some of the tracks are. Words of the Dead especially is a crunching pounder, and What You Become the sort of powerful belter that Hetfield and co used to produce at their best. Even if only listened to in reminiscence of Metallica's glory days, Evile are still very much worth listening to.